RMK Hiker's Passport costs €10. 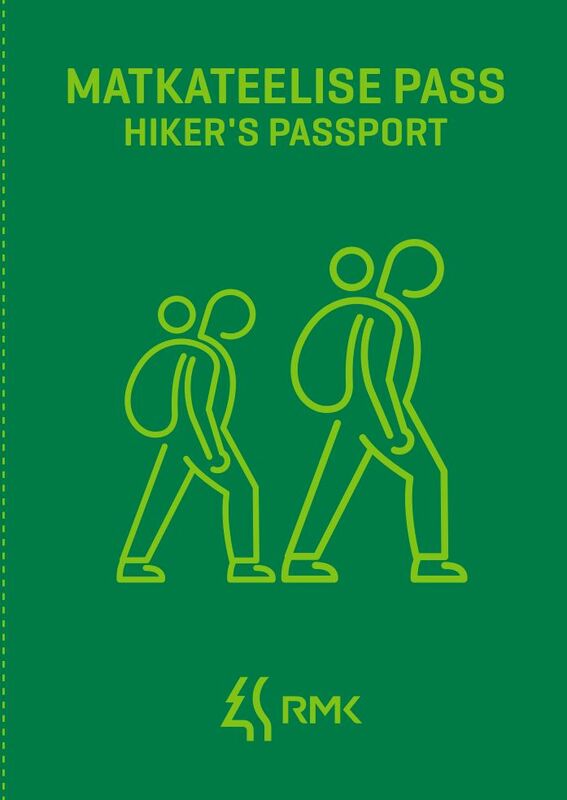 Hiker's Passports are available in RMK Visitor Centres. A Hiker's Passport is personal – it belongs exclusively to the person whose name is shown in the passport. After the document is bought it is bound to the hiker, so that benefits are guaranteed just for the person who needs them the most and has earned them. When hiking on the route, the hiker can get a stamp from each Visitor Centre on their way in their passport. The stamp certifies their hiking on the trail and ensures benefits for them in the following Visitor Centres. You'll get the code from the Visitor Centre. If the hiker gets to the Visitor Centre outside its opening hours, the stamp can still be activated (although the hiker would not get an actual stamp then) – by sending the text message as described above. The code can be found at the Visitor Centre. In such a case, the hiker can get the stamp in their passport later, when they visit the same Visitor Centre at another time. Storing equipment at Visitor Centres. The parcel can be sent either directly to the Visitor Centre or a Post Office. The parcel will be taken from the Post Office by an employee of the Visitor Centre. Weight limit of a postal parcel – approx. 10 kg. (0 stamps). For instructions for preparing and addressing the parcel, please see below. Benefits can be enjoyed for validated stamps only. This means that when you use a benefit, the respective number of stamps in your passport are deemed as used (a respective note is made at the stamp) and the stamp cannot be used for getting another benefit. For example, the hiker can have three unused stamps in their passport, for which they can, if they wish so, get three cups of free coffee and three cereal bars. Such benefits can only be used during the opening hours of the Visitor Centre. If the hiker goes on a very long walk, it is reasonable to send a part of their gear (fuel for camping stove, a change of clothes, food etc.) farther down the trail – several weeks' supplies can be quite heavy to carry on your back. RMK Visitor Centres along the Hiking Route offer the holders of Hiker's Passports the possibility of storing equipment. A package can be either taken to the Visitor Centre by the hikers themselves (or delivered by their friends) or sent to the Visitor Centre as a postal parcel. Mailing addresses of RMK Visitor Centres can be found at the loodusegakoos.ee website. The parcel must be one single unit (all the mailed stuff must be packed in one bag or box). The parcel must not be too heavy – Visitor Centre employees have to be able to lift it. The approximate weight limit is 10 kg. The parcel must not contain perishable, fragile or strong-smelling substances. - Approximate time of receiving by the hiker. No parcel shall be held at the Nature Centre for more than 1 month.